According to a recent study, over 20 percent of men and 35 percent of women experience acne after the age of 30. At the same time, remote indigenous societies--such as the Inuit before they “moved to town” in the 1960s--experience no acne at all, even among their teenagers. Many things have been cited as causing acne, from sugar, chocolate, or pizza to dirty pillowcases, hormones, or genetics, but none of these “causes” have been able to explain the majority of acne cases, nor why chronic acne is on the rise. Using her FBI intelligence analyst skills, Melissa Gallico identifies fluoride as the root cause of the modern acne epidemic. Chronicling the existing acne research, she reveals where each study went wrong and what they missed. She shares her personal 20-year struggle with severe cystic acne not only on her face, but on her neck, chest, back, and even inside her ears. She explains how her travels around the world and her intelligence work helped her pinpoint exactly what was causing her treatment-resistant flare-ups--fluoridated water, foods, dental products, and the systemic build-up of childhood fluoride treatments. She details how to avoid fluoridated foods and beverages and explains how sources of fluoride work their way deeply into our daily lives through water as well as fluoride-based pesticides, pharmaceuticals, and common household products. The author exposes the corrupt science used to convince people of fluoride’s health benefits and examines the systemic toxicity of fluoride, including its anti-thyroid and neurotoxin effects, how it remains in the body for years, and how it can cause the symptoms of illnesses, such as arthritis, fibromyalgia, and depression. She explains how to displace fluoride stored in your bones and tissues through nutrition and the careful use of iodine. Offering a guide to freeing yourself from persistent adult acne, Gallico shows that it is possible to heal your skin even when dermatologists and their prescriptions have failed. 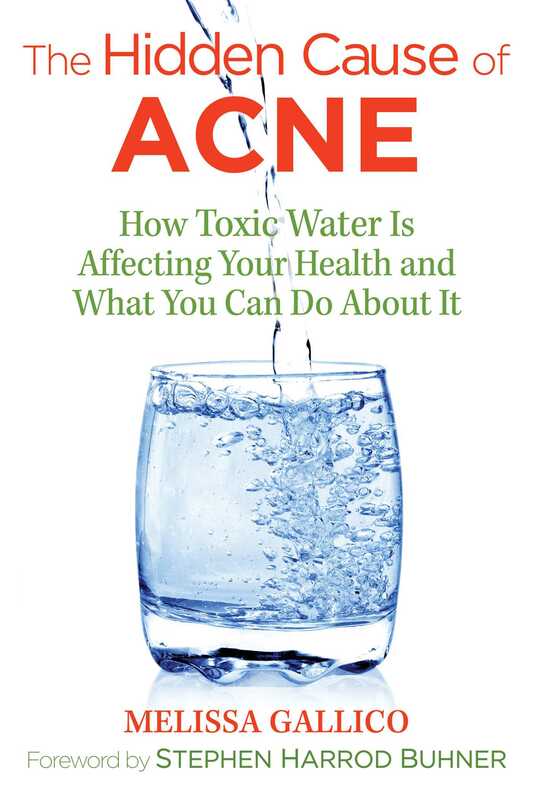 It can be disconcerting to learn the cystic welts on your face are caused by the fluoride added to common tap water. The everyday world takes on new shades of danger. You start to wonder about the free glass of ice water at a restaurant. Maybe you notice an unsettling feeling as you sink into a warm bath. Preventing acne should be as effortless for you as it is for a native Kitavan Islander who inhabits the Trobriand Islands of Papua New Guinea in the Southwest Pacific. The longterm solution is to end artificial water fluoridation and demand more responsible use of fluoride-based pesticides (see Appendix: The Plan). But you don’t have time right now to rewrite bureaucratic decrees. You need to start healing your acne today. Artificial water fluoridation will end--and I predict it will be our generation that makes it happen--but you don’t have to wait until then before you can live acne-free. Once you understand where fluoride comes from and how it makes its way into the industrialized food supply, you will know how to choose foods and drinks that are naturally low in fluoride. More importantly, understanding those reasons elucidates how to choose options that will not contribute to future breakouts. Fluoridated water is just the beginning, unfortunately. Soft drinks, juice, iced tea, coffee, and other beverages can all be made with fluoridated water, and if so they will contain fluoride in equal amounts or higher to the water with which they were produced. Researchers at the University of Iowa measured fluoride concentrations of 332 soft drinks and found over 70 percent contained fluoride at levels exceeding 0.6 ppm (Heilman et al. 1999). Researchers in New Zealand examined 532 juices and juice drinks and found fluoride levels ranging from .02 to 2.8 ppm (Kiritsy et al. 1996). The researchers in both studies accounted for the wide range of fluoride in large part because of variations in the amount of fluoride of the water used in production. Whereas beer is made from brewing certain grains in water, wine is made from crushing grapes. There’s no water added. The reason wine can contain significant amounts of fluoride is because of the Western Grapeleaf Skeletonizer. A caterpillar [.6] inches [in length] with conspicuous tufts of long black poisonous spines, they feed on the undersides of grape leaves before transforming into luminescent blue-winged fairies (or moths). The Omnivorous Leafroller, a bell-shaped character with a gray bat-like snout and brown ombre wings, is also to blame. To limit crop damage from Western Grapeleaf Skeletonizers and Omnivorous Leafrollers, some grape growers use a pesticide called cryolite which acts as a deadly poison in their grapeleaf-greedy bellies. Cryolite was already featured in the official version of the story of fluoridation outlined in chapter two, the young dentist’s interest in fluoride was sparked when he realized it was the cause of the townspeople’s brown teeth, a condition known as “Colorado Brown Stain.” In Colorado Springs, where he settled, the community watershed was high in fluoride because it contained deposits of cryolite from the rock formations of Pike’s Peak. This is the same mineral, sodium hexafluoroaluminate, that is crushed and sold to grape growers under the trade name Kryocide, although now it is widely produced synthetically by combining sodium, fluoride, and aluminum. The Western Grapeleaf Skeletonizers and Omnivorous Leafrollers do not only feed on grapes used to produce wine, but also on grapes used to produce juice, which means the problem of fluoride-laden insecticide extends to grape juice made from the San Joaquin Valley region, as well. In a study of 43 ready-to-drink fruit juices, researchers from Tufts University measured the highest amount of fluoride in grape juice from the baby food company Gerber at 6.8 ppm, well above the EPA’s already inflated maximum contaminant level for fluoridated water of 4 ppm (Standard et al. 1991). Even fruit juices and other fruit drinks that don’t have the word “grape” in their name often contain blends of grape juice with significant amounts of fluoride. If juice is made with fluoridated water it can still contain fluoride even if it is labeled as organic. Grains on their own don’t contain significant amounts of fluoride, but extruded breakfast cereals like “puffed” rice, “flaked” corn, and “shredded” wheat often do. The reason is because they are processed with the same type of technique used in the manufacturing of milk solids. In the production of most commercial breakfast cereals, grains (usually rice, oats, corn, or wheat) are mixed with water, processed into a slurry, and then placed in a machine called an extruder where they are forced through a small hole at a high temperature and pressure, shaping them into lucky stars or whatever shape the mascot on the box dictates. When the water from the slurry evaporates, any fluoride it contained is left concentrated in the cereal. One study of cereals processed in fluoridated versus non-fluoridated regions found significant differences in their fluoride content, with cereals processed in fluoridated water ranging from 3.8 to 6.3 ppm (Warren and Levy 2003). Virtually all boxed breakfast cereals are manufactured with this extrusion process, even “organic” ones found in the health food store. Since the fluoride in water is not a pesticide, it does not count for organic labelling purposes. Heilman, Judy R., Mary C. Kiritsy, Steven M. Levy, and James S. Weelph. 1999. “Assessing Fluoride Levels of Carbonated Soft Drinks” Journal of the American Dental Association 130(11): 1593-1599. Kiritsy, Mary C., Steven M. Levy, John J. Warren, Nupurguha-Chowdhurym, Judy R. Heilman, and Teresa Marshall. 1996. “Assessing Fluoride Concentrations of Juices and Juice-flavored Drinks.” Journal of the American Dental Association 127(7): 895-902. Stannard, Jan G., Youn Soo Shim, Maria Kritsineli, Panagiota Labropoulou, and Anthi Tsamtsouris. 1991. “Fluoride Levels and Fluoride Contamination of Fruit Juices.” The Journal of Clinical Pediatric Dentistry 16(1): 38-40. Warren, John J., and Steven M. Levy. 2003. “Current and Future Role of Fluoride in Nutrition.” Dental Clinics of North America 42: 225-243. Melissa Gallico is a former military intelligence officer, Fulbright scholar, and intelligence specialist at the Federal Bureau of Investigation. She has instructed classes for FBI analysts at Quantico and provided intelligence support for FBI national security investigations. She graduated with honors from Georgetown University and holds a master’s degree from the University of St. Andrews in Scotland. She lives in South Florida.